"...she also likes to spend time in the bar. On many an evening she can be found in Westminster's favored political watering hole, the Red Lion, despite having to cross four lanes of traffic to get there. Apparently at the end of the evening the barmaids regularly have to carry her back home." 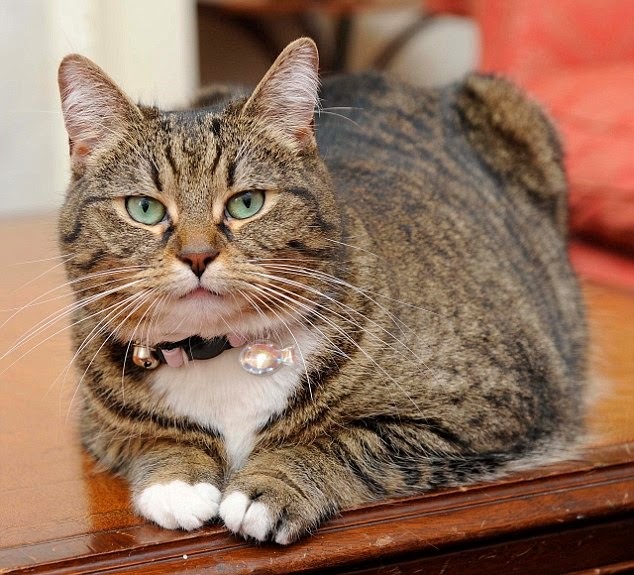 Freya, the resident feline of Chancellor of the Exchequer George Osborne had an especially close call on the evening of August 7th when she was struck by a motorist outside of her residence at the world famous 10 Downing Street. The details are pretty sketchy but she apparently was attempting to cross perilous Whitehall Road when she was mowed down. Fortunately, kindhearted pedestrians came to her rescue and saw to it that she was rushed to a veterinarian. As best it could be determined, the nature and extent of her injuries never have been made public. Consequently, it is not known either how much trauma she was put through or how long it took her to recuperate. All that can be said is that she certainly looks well enough in a photograph of her that was posted September 16th on the Facebook page of the Foreign and Commonwealth Office. That of course could be an old snap. The Chancellor afterwards expressed his gratitude to those who came to Freya's assistance but insisted that he would pay for her treatment out of his own pocket. No information has been released as to the identity of her assailant but it would seem likely that she was the victim of a hit-and-run motorist in that it was passersby that came to her aid. The good news is that Freya somehow survived and is still gracing the face of the earth. The bad news is that Osborne, his authoress wife, Frances, and their two children, Luke and Liberty, have not publicly announced any preventative measures designed to better protect her fragile life. Relying upon the general public in order to look after a cat is an extremely dicey proposition as both a nameless two-year-old tuxedo and twenty-seven-year-old dog lover Dylan Cottriall of St. Helens in Merseyside found out firsthand back in July. Emaciated, dehydrated, and near death as the result of an infestation of fleas that were sucking the very life out of her, the cat had keeled over in the gutter alongside a busy highway. Unlike the Londoners who came to Freya's rescue, none of the passing motorists could be bothered with stopping to check on her condition. Even Cottriall at first thought that she likely had been run down and killed by a hit-and-run motorist but, thankfully, he had enough compassion and concern for her in order to pull over and make certain one way or the other. 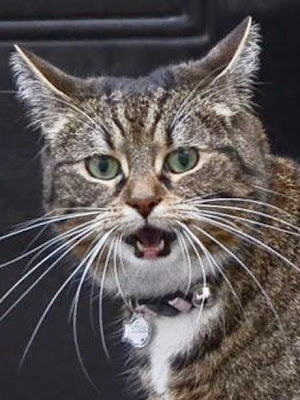 "I stopped and went over to her to see if she had a collar and it was then I could see she was moving," he related to The Reporter of St. Helens on July 11th. (See "Outrage as Drivers Ignore a Dying Cat.") "She was just a bag of bones and had simply given up. Although she was at death's door she didn't stop purring even though she was too weak to do anything to help herself." Cottriall then rushed the cat to Paws n Claws where she was provided with the emergency veterinary care that she so desperately needed in order to recuperate and thus to go on living. 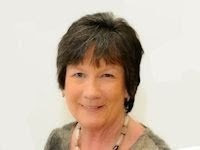 At last report she was in foster care with Gill Farrar of St. Helens. Although little or nothing is known about the events that led to her abandonment alongside that busy thoroughfare, it is an entirely different story as far as Freya is concerned. Born in April of 2009, Osborne reportedly purchased her as a present for his children while he and his family were residing in Notting Hill, a district in the Royal Borough of Kensington and Chelsea in central London. She did not stick around for long, however, and instead mysteriously disappeared a few months later. The Osbornes reportedly blanked the tony neighborhood with "Lost Cat" posters but Freya never was located. They eventually wrote her off as being dead and forgot all about her. 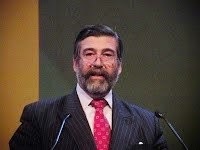 The Conservatives later prevailed in the 2010 election and a year later the Osbornes moved into 10 Downing Street when George became chancellor of the Exchequer. As was the case not only with Mark Twain but Prime Minister John Major's cat, Humphrey as well, the news of Freya's death turned out to be premature. 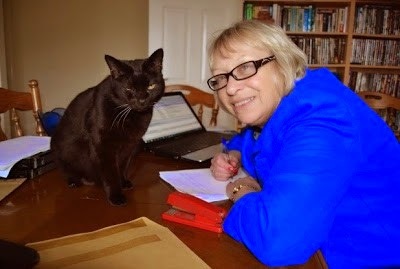 In June of 2012, Frances received the shock of her life when she got a telephone call informing her that Freya not only had been found but, best of all, was alive and well. The identification was made thanks to implanted microchip after Freya had been brought to a veterinarian for unspecified reasons by an unidentified neighbor of the Osbornes in Notting Hill. As best the story can be pieced together, the neighbor had not seen the posters and, believing her to be a stray, had been feeding her in a garden. Since the neighbor resides only a few streets removed from the Osbornes' dwelling, the only logical conclusion to be drawn from events is that they neither searched very hard nor very long for her. In particular, it is totally inexcusable that they did not personally knock on every door in the neighborhood. That criticism in no way obviates the myriad of difficulties associated with locating an errant cat. Motorists, dogs and other animals, as well as ailurophobes kill them with impunity and afterwards their corpses are quickly disposed of by either garbagemen or the summertime heat. Animal Control officers, the RSPCA, and other so-called humane groups steal and exterminate them all the time. Plus, they often become accidentally trapped inside automobiles, boxes, discarded furniture, and other movable objects and as a result wind up hundreds, even thousands, of miles from home. 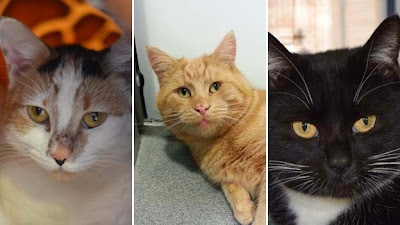 Many private individuals also rescue homeless cats and then lock them up permanently inside, thus foreclosing any opportunity for them to ever return home. In spite of all those impediments, if a lost cat is still living outdoors on its home turf someone likely has seen it and probably is feeding it. Although the neighbor in question is to be commended for feeding and providing Freya with veterinary assistance, it is shameful that the individual did not provide her with shelter. Not only are London winters far from being pleasant affairs, but she would have been much safer spending at least part of her time indoors. 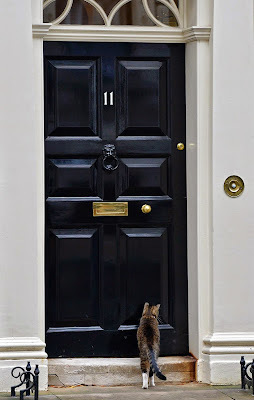 After having been successfully reunited with the Osbornes, Freya took up residence with them at 10 Downing Street which, contrary to popular belief, serves as the official residence of the chancellor of the Exchequer. The prime minister and his family reside at the more commodious number 11. 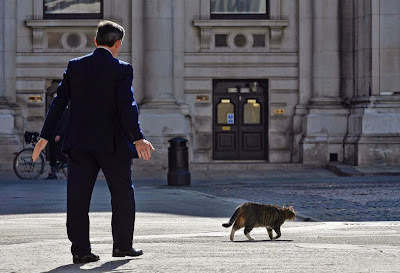 It did not take the intrepid moggy long, however, to put her own indelible paw prints on her job as the number two mouser in Her Majesty's government. That began when the Osbornes, not wanting to lose track of her again, outfitted her with a £50 diamante collar with a tag. One of the numerous limitations associated with implanted microchips is that they neither can be seen nor deciphered with the naked eye; for that, scanners owned almost exclusively by veterinarians and shelters are required. 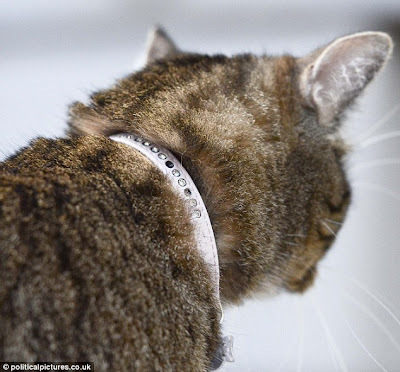 It therefore was fortunate that the Osbornes had equipped Freya with a collar and a tag because in May of this year she did yet still another runner. On that occasion, she wound up in Vauxhall, more than two kilometers removed from home, and in the borough of Lambeth. Fortunately, she was found by Kate Jones of Thames Reach's London Street Rescue who allowed her to spend the night on her pillow. Thanks to the information contained in Freya's tag, Jones was able to contact the Osbornes who immediately dispatched a chauffeur-driven limousine in order to collect her. It is unclear from press reports but apparently Freya was AWOL for only one night. Her deliverance did not come without a political price tag, however, in that Jones took full advantage of the golden opportunity presented to her in order to post not only a photograph of Freya online but to accompany it with a blast at Osborne for his disgraceful neglect of the homeless. Regrettably, there is not any evidence to suggest that the dressing down that he received from her has had any impact upon his policies. The dangers associated with Freya's occasionally getting lost pale in comparison to the menace posed by London motorists. In particular, she is known to be a regular at the Red Lion located at 48 Parliament Street (a continuation of Whitehall under a different name) and a little less than half a kilometer removed from home. "...she also likes to spend time in the bar. On many an evening she can be found in Westminster's favored political watering hole, the Red Lion, despite having to cross four lanes of traffic to get there," is how Oliver Wright of The Independent described her perilous trek on June 7, 2013. 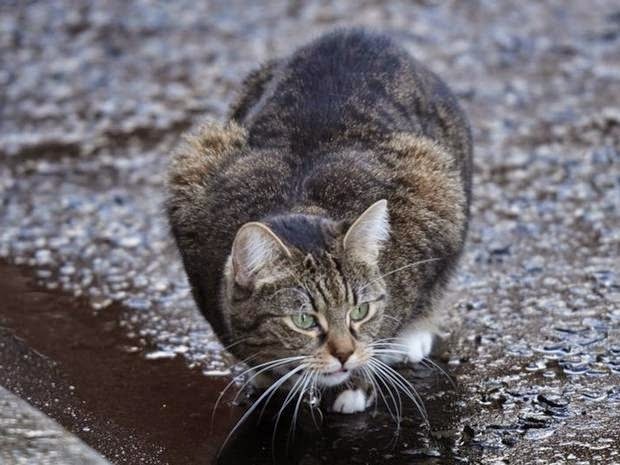 (See "Lost Pet or Double Agent? 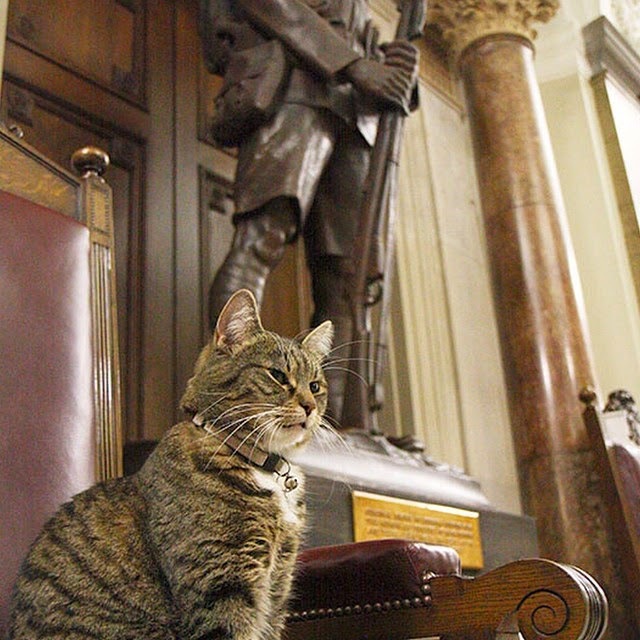 Meet Freya, the Roving Tabby of the Treasury.") "Apparently at the end of the evening the barmaids regularly have to carry her back home." She also has been sighted backstage at the Trafalgar Studio Theatre at 14 Whitehall, also half a kilometer from home but in the opposite direction from the Red Lion. Her roaming around the Foreign and Commonwealth Office, the Cabinet Office at number 10, and Exchequer do not pose much of a threat to her safety in that they are closely situated together and on the same side of Whitehall. 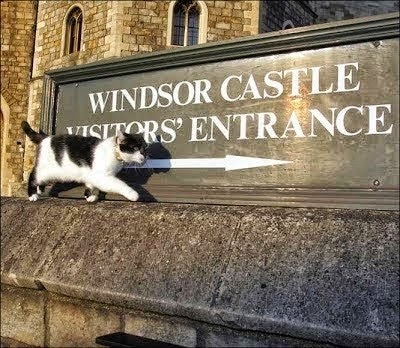 The failure of Old Blighty's political elites to better protect their resident felines is made all the more inexcusable by the petit fait that it would be rather easy and inexpensive for them to create a safe haven around numbers ten and eleven for Freya, Larry, and all future cats to roam. The area already provides enough gardens and public buildings in order to furnish them with plenty of fresh air, sunlight, exercise, and mental stimulation all within a safe and secure environment. All that is needed would be to extend the height of the fences and walls which surround the compound and to install netting on the top. Aesthetics are not an issue given that Downing Street has been closed to the public since 1989. An even better solution would be for the authorities to go whole hog and close Whitehall and the City of Westminster to all vehicular traffic. The time has come to remove both murderous motorists and their greenhouse gas emitting noisy machines from the inner cities and to transform those areas into pedestrian malls. 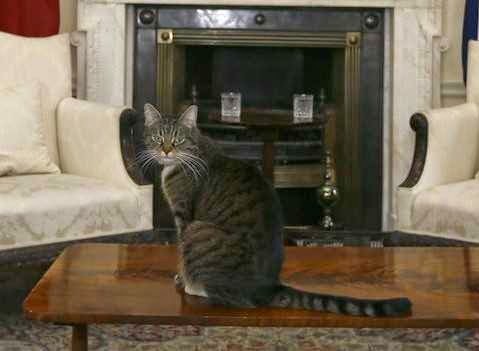 Neither proposal would be too much to ask especially considering how all recent occupants of Downing Street have so nakedly exploited their cats as valuable political props while simultaneously demonstrating little or no regard for their personal safety and well-being. Almost as shameful, no animal protection group in England is willing to so much as even contemplate holding them accountable under the anti-cruelty statutes. The cold shoulder that Cameron and his minions have shown Larry over the years is a good case in point. 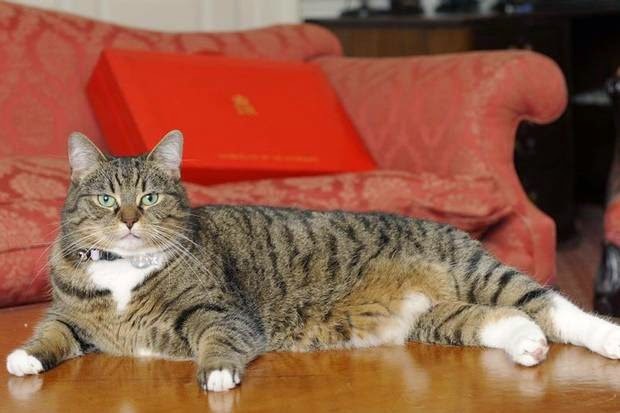 Back in 2009 when he was still in the opposition and only daydreaming of political power and glory, Cameron put the kibosh on any notion of there being a resident feline in any new government that was led by him. A fork in the road of sorts was reached last year with the publication of Matthew d'Ancona's tome, In It Together. 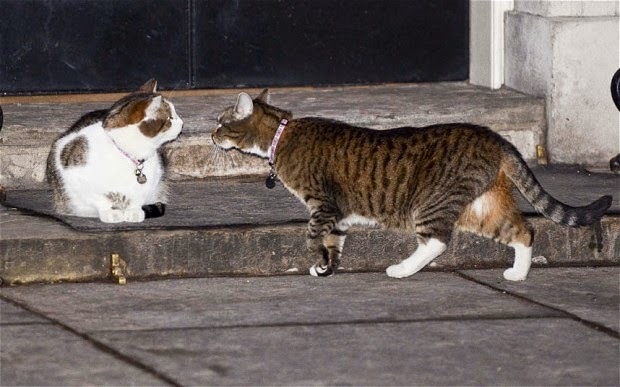 In the tell-all exposé, d'Ancona claims that Cameron does not care for Larry because he has failed to solve the rodent problem plaguing his residence and leaves cat hairs on his expensive suits. The prime minister also apparently does not even like the smell of cat food. Once news of Cameron's reported antipathy toward Larry became public fodder a "Save Larry" campaign was launched on Twitter and that, at least for the time being, has saved both his job and home. "I can set everyone's mind at rest in the #Save Larry campaign," Cameron tweeted. "He and I get on purr-fectly well. The kids love him too." 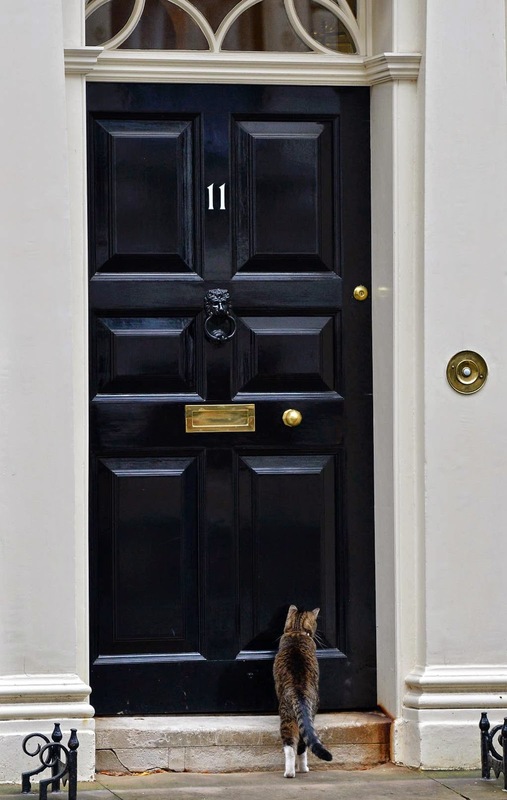 Should the Tories fail to prevail in next year's upcoming election, Cameron will no longer need Larry and that very well could end up costing him his home. 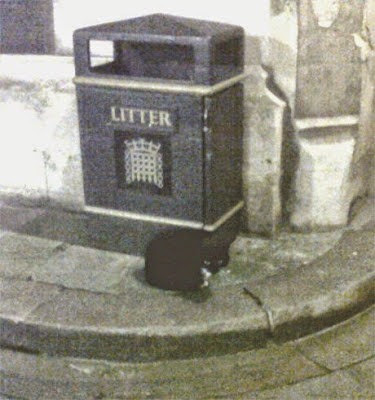 In that case, he most likely would be either sent back to Battersea or fobbed off on to an obliging staffer. That is precisely the cruel fate that befell Humphrey. Although both the Iron Lady and Major welcomed him with open-arms, Tony Blair's resident witch, Cherie, could not bear the sight of him. The miserable old hag, whom the Countess of Wessex once referred to as "horrid, horrid, horrid," first attempted to have him done in and when that ploy was foiled by Fleet Street she had him exiled to the residence of an unidentified staffer. "Humphrey is voting with his paws," a Tory spokesman chimed in on that unhappy occasion. "After eight happy years under a Conservative government he could take only six months of Labor." He died in obscurity in March of 2006, but never has been forgotten. "He has caught numerous mice and the odd rat," a Cabinet dossier compiled on him and released in 2005 stated. "By a perhaps unfair comparison, Rentokill have been operating for years and have never caught a thing." 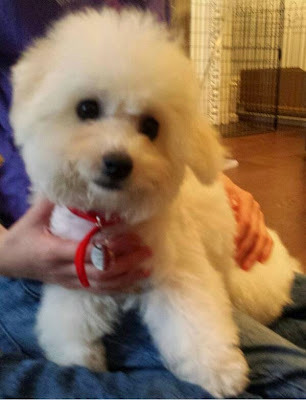 A simply adorable black and white female named Sybil who was owned by Osborne's predecessor, Alistair Darling and his wife, Maggie, was treated even shabbier than Humphrey. Brought down from Edinburgh by the Darlings on September 10, 2007, she initially was given free rein of the grounds and even had her own basket at the Exchequer. Alas, even that valuable and much sought after talent was not nearly enough in order to save either her job or home because Darling's boss, Prime Minister Gordon Brown, turned out to be a closet cat-hater. Sybil accordingly lasted only six months on the job before she was unceremoniously sacked and cruelly fobbed off on an old acquaintance of the unconscionable Darlings. The one thing that both Freya and Larry have going for themselves is that they are owned by Tories who are occasionally more favorably disposed toward the species than their counterparts in the Labor Party. Additionally, Osborne appears to genuinely like animals in that in addition to Freya his family has a budgerigar named Gibson, a Bichon Frise named Lola, a hamster, and a pair of goldfish. The odds therefore are at least even that he will choose to hang on to Freya regardless of what happens next year at the polls. Unless he dramatically mends his irresponsible ways and takes considerably better care of her, however, that is going to be a moot point. In spite of their myriad of shortcomings and failings as guardians, English prime ministers and chancellors of the Exchequer treat cats slightly more humane than their utterly nauseating American counterparts who care little or nothing about the species, animals in general, and Mother Earth; au contraire, the only things that they care about are sucking up to the rich, lining their pockets, killing people, and telling lies. All of those atrocities are in addition to the tens of thousands of bobcats, cougars, jaguars, lynxes, ocelots, and other large cats that are being systematically liquidated each year by the USDA's Wildlife Services and other federal agencies. Even more alarming, the fate of both small and big cats alike is not even part of the political discussion; the president and the feds merely assume that they have a divine mandate to do with them as they see fit. Although politicians are entitled to own cats just like everyone else, they should be required by law to not only take proper care of them but to respect their inalienable right to live. Furthermore, in failing to fulfill their moral and custodial responsibilities to them, they are setting a simply horrible example for their constituents. 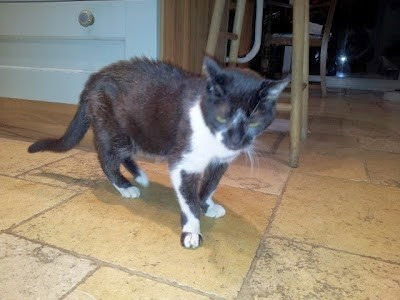 An individual can, either wittingly or unwittingly, fail a cat in countless ways but to knowingly allow one to regularly venture out into traffic on a busy, four-lane road constitutes the very epitome of animal cruelty and Osborne accordingly should be held accountable for his shameful negligence. Unlike with Larry, however, there does not appear to be a "Save Freya" campaign on the horizon and that makes her situation all the more desperate because her precious life is rapidly slipping away like sand through an hourglass. 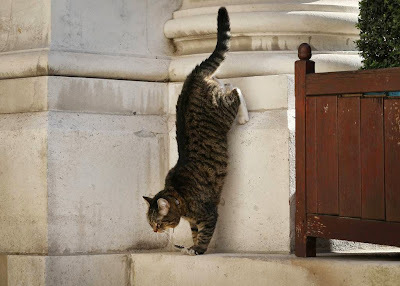 Photos: The Independent (Freya up close, at home, in the street, and scaling a wall), Foreign and Commonwealth Office on Facebook (Freya beside a statue), The Reporter (St. Helens' cat with her rescuers), Political Pictures (Freya's diamante collar), and The Telegraph (Freya and Larry).